To say that Catharine and I haven’t written a holiday letter often is a gross exaggeration. We’ve never written one. But those from some of our friends have given us so much pleasure we thought we’d give it a shot. Of course the result will be erratic – like our cross-country skiing in the Laurentians – but we have fun doing that, and we’re hoping you’ll have some fun reading this. The past year has been indeed remarkable. 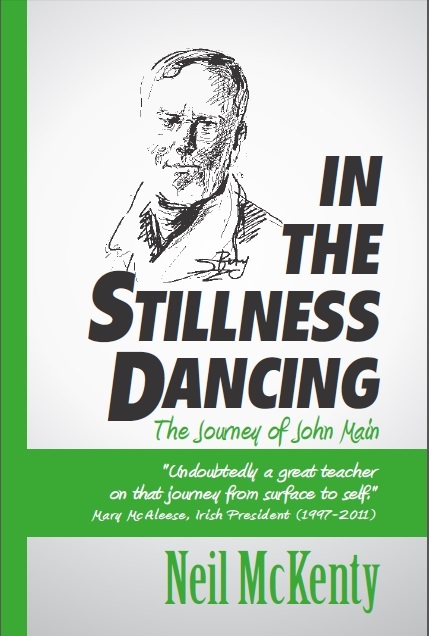 It began in January when my second book, In the Stillness Dancing, was published in London, England. To back track a moment. I had been doing public affairs broadcasting since 1972 … during my last ten years, I hosted what became a popular phone-in program, “Exchange.” So why did I resign? That brings me back to the book. In the fall of 1977 two Benedictine monks, John Main and Laurence Freeman, arrived from London to begin a meditation centre in Montreal. Because of a chance remark, I met Dom John Main in 1979 – a tall, impressive man with a sparkling Irish wit rooted in his own origins in County Kerry. Gradually we learned more about his life: Jesuit educated, British Intelligence Service, a student and later a professor of law at Trinity College, Dublin, civil servant in Malaya, barrister, Benedictine monk. In Malaya John Main met a charismatic Hindu near Kuala Lumpur who led him by a circuitous route to a Christian form of meditation going back to the 4th century and beyond – a form of meditation that induces deep interior silence through concentrating on a prayer word, or mantra. It was this form of Christian meditation that John Main came to Montreal to develop and teach. His teaching was intense, but short. In December 1982, John Main died of cancer at the age of 56. The night of his death his close associate and friend, Dom Laurence, asked me if I would be interested in writing John Main’s biography. I accepted immediately … during the next couple of years, Catharine and I spent as much time on research as we could. This involved intense working trips to Dublin, London, and Washington, where John Main spent most of his adult life. (Catharine tried to convince me that we should go to Malaya, but Il y a une limite.) Publicizing John Main’s biography was a joint enterprise. In this effort, Catharine and I were helped by many friends. Sister Gertrude McLaughlin advised us on the book from the beginning. John and Clare Hallward lived through every phase of the book with us. Clare is an excellent editor which means she not only improved the text but she also never took my tantrums seriously. John’s enthusiasm carried us through the difficult periods inherent in writing any book. All of us had fun at the book launchings in Montreal, especially at the Double Hook with Judy Mappin, the Anglican Diocesan Book Room with Jack Sheppard, and the United Church book store with Mary Beth Moriarity. I was able to talk about the biography on radio, and it was especially gratifying to return to my old program, “Exchange,” where my successor, Joe Cannon, asked me to stay for a second hour. In Montreal, the festivities climaxed with a reception hosted by the Prior, Laurence Freeman, at the Benedictine Abbey on Pine Ave. About this time, Catharine and I flew to Syracuse, New York, to give a seminar on Christian meditation – it is not as difficult as you might think. All the important parts are in silence. While all this was going on we still managed to get to the Laurentians for several week-ends of cross-country skiing. Catharine and I are not great skiers, but we enjoy the outdoors, the lovely Laurentian mountains, and the camaraderie around the blazing fireplace. Joining the winter instead of fighting it seems to make it shorter. It seemed short indeed this year because in the spring we were off on a trip to which we had both long looked forward. The first stop was Dublin. The highlight of our stay was a reception at Trinity College (founded in 1591) to launch the biography. Main had been a student and a law professor at this cottage and lived in a lovely suite of Georgian rooms where his sister Yvonne helped him entertain students, some from his beloved Malaya. We stayed in a house near the sea where James Joyce once walked and wrote. We flew to London for ten days, where we explored Churchill’s cabinet war rooms. After seeing a couple of plays, and dancing up a storm at a lively Italian restaurant, and making my usual pilgrimage to Speaker’s Corner in Hyde Park, Catharine flew off to Germany and I flew back to Montreal making vague plans to write a biography of Catharine’s grandfather, R.J. Fleming, four-time Mayor of Toronto. These plans were rudely interrupted by a telephone call from the executive producer at Montreal’s only commercial English language television station, CFCF-TV. More of Neil’s letters are available in McKenty Live! The lines are still blazing..click on the cover below for more information. Next Entry: McKenty Books Bookshop – new books, formats and editions.